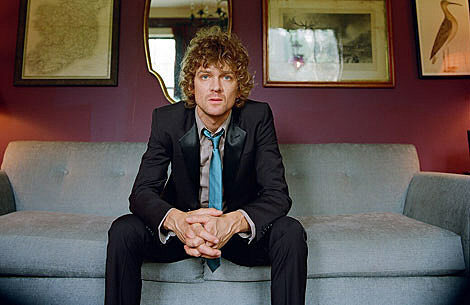 Brendan Benson‘s latest solo record, My Old, Familiar Friend, came out over the summer on August 18th. A day earlier his tour kicked off with a show at NYC’s Bowery Ballroom on August 17th. Now he’s on tour again, with two NYC-area dates this weekend. Brendan Benson plays Friday, December 4th at (Le) Poisson Rouge (tickets) and Saturday December 5th at Maxwell’s (tickets ). Cory Chisel and the Wandering Sons open both shows. Curiously, none of the songs he played as a co-frontman of the Raconteurs were in the set, but considering that his new solo record, My Old, Familiar Friend, was recorded two years ago and finally released this August, who can blame him? Since 2005, he’s toured and recorded two albums with Jack White and company and has probably been itching to play his solo stuff for a while now. His backup band, which consisted of a drummer, bassist, and second guitarist/keyboardist, is as tight an outfit as one could ask for and brought out the subtle dynamics and intricacies to Benson’s songwriting without losing any of its vigor.